Los Angeles (July 20, 2018) — The Asian American Studies Center of the University of California at Los Angeles announced Friday that Aiko Herzig-Yoshinaga passed away on Wednesday, July 18, 2018. She was 92. Herzig-Yoshinaga is remembered for her leadership and a lifetime commitment to justice. 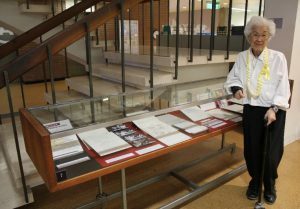 As a resident of Washington, D.C., she researched the National Archives to uncover key documents that led to the recognition of the unjust role of the U.S. government in incarcerating more than 120,000 Japanese residents during World War II. The paper trail that she and her late husband, Jack Herzig, discovered helped to pave the way for the passage of the 1988 Civil Liberties Act, an official apology by the government, reparations of $20,000 for each camp survivor, and the vacating of wartime convictions of Japanese Americans who challenged the forced removal in Coram nobis cases. Prior to this, she was involved in civil rights work in New York through Asian Americans for Action and related activities. Jack Herzig died at age 83 in 2005. The legacy of Herzig-Yoshinaga and her husband can be found, in part, in the Jack and Aiko Herzig Papers housed at the UCLA Library Special Collections. This collection represents their decades-long personal research and their work with the Commission on Wartime Relocation and Internment of Civilians, the Office of Redress Administration, the National Council for Japanese American Redress, and the Civil Liberties Public Education Fund. The UCLA Asian American Studies Center partnered with Herzig-Yoshinaga to archive her collection for free public community access. A short video about the collections (shared below), features a passage on her life and work will raise further awareness of her important contributions.